In this guide, I will show you three methods of customizing Moto E ringtones: 1). select from the pre-installed ringtones; 2). use music files in your Moto E; and 3). use music files in your PC. So, you can use ringtones that you like and you can customize Moto E ringtones as you want. There are about 40 pre-installed ringtones in your Moto E. You can easily select any one of them that you prefer. To set your ringtones, go to Settings-Sound. Tap phone ringtone as shown below. 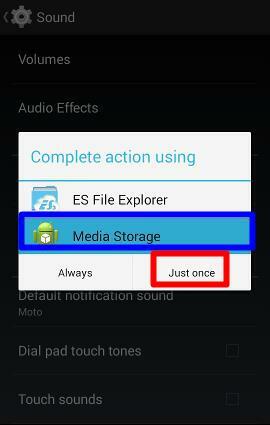 If you followed this guide (and you should) and installed ES File Explorer, you may have two options as shown below. In this case, tap Media Storage, then tap “Just Once“. You then can select any of the pre-installed Moto E ringtones (about 40) . Scroll up and down to select the desired one, then tap OK to change the ringtone for your Moto E.
After you tapping OK, the new ringtone applies immediately. Now, you get a somewhat different ringtone! If you are not happy with the pre0-installed ringtones, or you want to use your own sound file, please read on. If you want to use the music/sound files that are already saved (e.g., downloaded or recorded) in your Moto E, you can easily use them as your Moto E ringtones. But before you can proceed to use these files as your ringtones, you need install a free app called ES File Explorer File Manger. If you haven’t install it yet, please follow our guide to install this app to your Moto E from Play Store. Once the app is installed, when you tap the Settings–Sound–Phone ringtone, you can tap ES File Explorer–Just Once as shown below. Then navigate to the sound/music file (e.g., mp3, m4a..) Tap the music file and the the file will be used as your new Moto E ringtone. The interface will close automatically and you will return to Settings-Sound page. You can also use the music file in your PC to customize Moto E ringtone. To use this method, you need a USB cable to connect your Moto E to the PC. Once you connect your Moto E to the PC using an USB cable, the phone should be recognized automatically and is identified as XT102X as shown below. 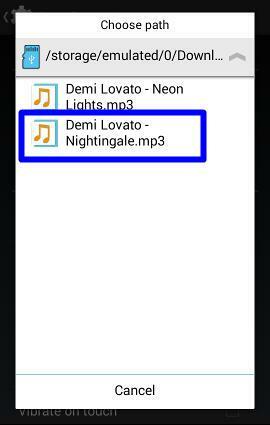 Click the Ringtones folder, you should find the 3 pre-installed music files (ogg format) as shown below. Now, you can copy any music files to this Ringtones folder. You may get a warning messaging as shown below when you copy some formats of the music file, e.g., mp3 file. Most of the time, it is safe to ignore this message. So, you check “Do this for all files”, then click Yes to copy. Once the files are copied to Ringtones folder, they should automatically appear in the ringtone list! Now, in your Moto E, go to Settings–Sound–Phone ringtone, you can select the copied file as your new Moto E ringtone as method 1! If you have ES File Explorer installed, you need tap Media Storage–Just one. Then select the music. Tap OK to change your Moto E ringtone immediately. Do you have any questions on customizing Moto E ringtone? If you have problems or questions on how to customize Moto E ringtone, please leave your questions in the comment box below. Any idea how to disable increasing ring manualy from the setting? There is no such setting in Moto E.
You can just copy it to the ringtone folder. Alternatively, you can install ES file explorer. 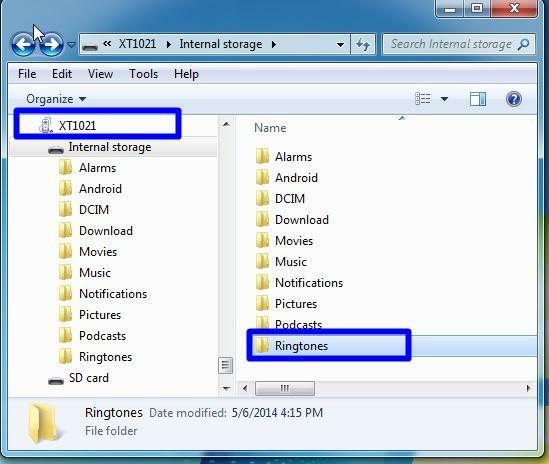 When setting ringtone, use es file explorer to locate the file on SD card. As shown in this guide, you can just copy the audio file to ringtones folder in whatever ways. How to disable ascending ring tone, It should ring at one tone only on Moto E.
How do I create & Access Group contact on Moto E. ? In People app, tap the third button (last one) in the top row to enter group settings. By default, Your G+ circles are shown here. Tap the second button (middle one) in the bottom one to create your new group. You can then add individual contact to this group. So I would like to know how to set different ringtones for different people. Everytime I set a ringtone it seems to apply itself to everyone else as well. How do I make it not do that? In Contacts app (or People app), open the specific contact, tap the edit icon (pencil), tap menu key (3 vertical dots), tap Set ringtone. Hi Simon and thanks for all of your assistance. Following above steps to set certain ringtone per caller, when i tap 3 times it opens “Join contacts”. Why did you tap 3 times? Where did you tap? Start contacts app, tap the contract, tap edit icon (pencil icon), then tap menu key (3 vertical dots best to right). You can then find the set ringtone option for this contact. By mistake i click on the always moto ringtone.So pls. tell me now how i use the ring tone from ES FILE EXPLORER. Settings–Apps-All. Find media storage, tap it, tap clear defaults..
Go to settings–app-ES File explorer, tap clear defaults. There is no setting for this. You have to use apps if you want to change this behavior. Anyway, this is a good option. You can use it together with vibrate. You probably can’t do it on moto e.
I have lost all the preloaded ring tones of my moto e plz help me with that how to got it back……. You will never lose the pre-loaded ringtones. I guess now when you want to set ringtones, it goes to ES File explorer directly, instead of the media storage. You get this because you chose “always” use ES file explorer last time. You can go to settings–Apps-ES File explorer, tap clear defaults. Then go back to ringtone settings and you should get two options: media storage or ES File explorer. To use any pre-installed ringtones, you need choose Media storage (you’d better use just once as well). No, Moto E doesn’t provide this option. I selected always by mistake what should I do now?? To reset the default app on Moto E, go to Settings–Apps. Tap the menu key (3 vertical dots in top right corner), tap “Reset app preferences”. After resetting the default app, when setting ringtones, Moto E now should ask you to choose one of the apps. how to set sim one ringtone and sim two ring tone is change. You cannot set different ringtones for SIM 1 or SIM 2 on Moto E. Both of the sim cards use the same ringtone settings. Please help me, how to set the ringtones. i don’t know es file explore. Please follow the guide. If you get problems, please let us know the error info or error messages. Unfortunately, I have not found any apps that can disable ascending ringtone son Moto E.
There are no such settings. You cannot set different ringtones for different SIM card in Moto E.
You need clear defaults in settings – apps – es file explorer, not inside the es file explorer app. When you try to set the ringtone, it should ask you whether you want to use es file explorer or media storage, if you choose media storage (and just one), you can then select the pre-installed ringtones. Did you choose media storage when setting ringtones? After choosing media storage, what did you get? Are you sure you didn’t install other ringtone apps? Did you choose media storage? 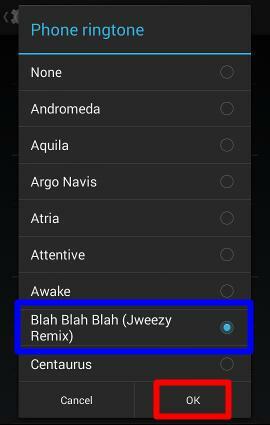 Did you get any other options when setting ringtones? Not sure. It’s very strange. You may back up your data and then perform a factory data reset. You can add multiple Google accounts at Settings–+ Add account (under accounts). But this is NOT multiple profiles (multiple users). Multiple users are only available on tablets, not on phones. If you can copy the music file into Ringtones folder (the simplest way is through PC), you can then use it as built-in ringtones. 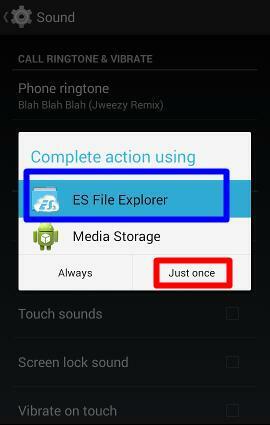 If you cannot copy the music file into the Ringtones folder, you need ES File explorer as explained in the guide. Settings – apps – es file explorer, tap clear defaults. Plerase note, if you choose ART runtime, apps can NOT be moved to SD card. Moving apps to SD card only work with Dalvik (default) runtime. In the people app, open the contact. Tap and hold the top part (default photo) and you will then get the option to set a photo for the contact. In people app, tap menu key (3 vertical dots), tap import from sim card. Please note, Moto E doesn’t provide any utility to save contacts to sim card. Did you try to adjust the volume? Does it work with headset? Maybe the earpiece is faulty. You may visit local Motorola service centre to have it checked. In my moto e …,,after connecting the phone with my laptop by data cable there was NO”” Ringtone folder”” came in internal storage of the phone……..please assist me what to do…….how to copy song from laptop to set as ringtone. What folders do you have for your phone when connecting to the pc? when my music is playing and if ph is in vibrate mode , and some one call me then at that time , idelly it should behave like music get stop and ph get vibrate but this is not happening in moto e mobile .Music playing continuos whether the call is coming or not..
can u plz guide me how to fix it ? If you pick up the phone, will the music stop? What do you mean “it’s not working”? 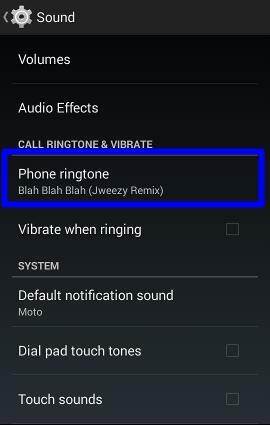 how to make custom alarm tone in my moto e? Similar to that for ringtones. The only difference is that you can save the custom alarm tone in the Alarm folder, not Ringtones folder. Whenever I get a call, the phone just vibrates for 5-6 seconds and then the ringtone starts. I want the phone to ring and vibrate at the same time. How do I do that? I think it should be about 2-3 seconds. Moto E always uses ascending ringtone. The ringtone increases slowly, If your ringtone volume is set at 50%^, it should take less than 2-3 seconds when the sound is loud enough. unfortunately, you cannot disable this feature. but you can increase the ringtone volume so that it take shorter time to hear it in a not-so-quite environment. 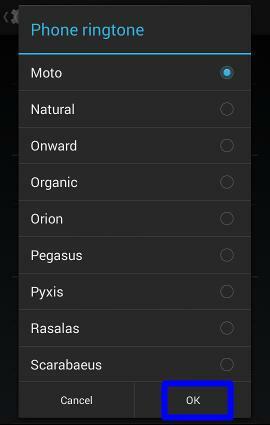 Yes, you can set different ringtone for individuals in people app. Open the contact in People app, tap the menu key (3 vertical dots), then tap set ringtone. When you play music, increase the volume. if it does not work, very likely, the speaker is broken. You may have to visit Motorola service centre to repair it. You warranty card should indicate the location of the service centre or the authorized contractor. Go to Settings–Apps, tap the menu key (3 vertical dots in top right), tap reset app preferences. Can we assign custom ringtones to individual contacts on Moto E. Please HELP! Yes, in people app, tap the contact, then tap the menu key (3 vertical dots). You can then find set ringtone for this contact. I just pressed phone storage always..how to change to file explorer now.. Settings – apps, tap the menu key (3 vertical dots), tap reset app preferences. From your pc, in the Google dashboard. On people app, open the contact, tap the default image. You will then be asked took select a photo to crop or take a photo. You can also manage contacts in pc from your Google dashboard. The contact info including the photos will be synced with your Moto E.
Settings–Apps, tap the menu key (top right), tap Reset app preference. Then try again. I have speaker problem in my Moto G 2nd gen. I hear a kirrr… Kirrr… sound when someone is talking in phone in the other side. Is there any app to solve this problem? Not sure. it could be due to mobile network or noise in the other side. Probably there are no apps for this. 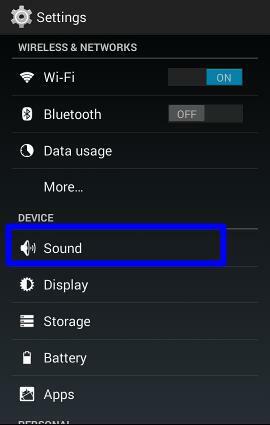 In Moto E, you can go to Settings–Sound–Audio effects. You may try to turn off audio effects. You need trim the audio file before selecting it because Moto E doesn’t other three utility to trim the file. Any free mp3 editors can do the job. i have moto e, sometimes it beep and display a notification “playing tone” for very short period may be for 1second, what does that “playing tone” mean? You can tap and hold the notification message, then tap app info to find out the app that sends this notification. Go to Sim toolkit menu and disable flash services as well as notifications for same. I have selected ES file Explorer file as always how can it be changed to Media storage? Settings –Apps –ES File explorer, tap “Clear defaults”. You cannot do this on moto e. The info is saved in the sim card by your carrier. Seldom you need change it. If you really need change it, you can do it in some other phones, e.g., Samsung or Nokia phones. Your carrier can also change it for you by sending you a mms . Open WhatsApp, tap menu key, tap settings,tap notifications. While setting the ringtone when I tap the Settings–Sound–Phone ringtone, instead of tapping ES File Explorer–Just Once as shown above, I tapped on the media storage and tapped Always. Now the option for ES File Explorer is not coming. Can you please tell me how to solve it. Settings – apps,tap menu key (3 vertical dots in top right), tap reset app preference. You may check your storage at settings – storage. Make sure you have enough available space in the phone storage. Then, you can go to settings – apps – messages,tap clear cache, tap clear data. You probably have to visit the service centre. Check teh warranty card in the box or contact the seller on the authorized service centers. Settings–Apps–ES File explorer, tap clear defaults. Then try again. “Normally”, there should be no issues to access the files without rebooting the phone. The problem probably is related to some other apps or settings. After rebooting the phone, if you try another file, do you get the same problem? I want to set mp3 file asthe notification ringtone on my phone…….how could I change it…. Similar to ringtones in this guide. You just put the mp3 file in the notifications folder, instead of the ringtones folder. You can also use es file explorer when setting notification tones. Exactly what I wanted to know….thankuu…. I have an issue setting ringtone from my SD card. When I had set an ringtone once initially I had choosed the option of ALWAYS from phone ringtones while setting the ringtone.. kindly guide me. First, it’s not a good practice to set filers in sd card as ringtones. You can copy the files to ringtones folder or any other folders in the phone storage. You can reset the default settings in settings – apps. Tap menu key, tap reset app preferences. Can Motorola put out an update so we can all end the problem of ascending in coming call ringtone? 1. are you talking about Motorola Assist? The settings are very simple. I don’t think you need different profiles. For meeting assist, it can only read your calendar. 2. to send group sms, you need create a group in people app, then choose the group as recipient.please note, this feature depends on your carrier. I mistakingly pressed the always button instead of just once while changing the ringtone, now am stuck with the default ringtones. I have also installed the ES File explorer app but still I don’t know how to change the ringtone of my choice? Please make me find my way, am kinda lost. It would be really helpful, also I copied a TV series in my moto e through a SD card, but it’s not showing. Please Help. You can reset it at settings – apps, tap menu key (3 vertical dots), tap reset app preferences. For TV files, you’d better copy it when you connect the phone to pc through usb. Anyway, you can reboot the phone to see whether they are shown in gallery app. If the video format is not supported or unknown, they will not be shown in gallery app. In this case, you can try vlc for android and play them directly. When I am trying to play the song in music player that shows an error, coudnot play the song you requested.can any body help me to solve that problem. The file could be corrupted. You may try another music player (for example) to see whether the file can be played. hi i have set one ringtone for my wife, but whenever she msg me in whatsapp its picking the same ringtone and ringing. i don’t want the ring tone for the msg tone. how to disable this? Open WhatsApp, tap menu key (3 vertical dots ), tap settings – notifications, uncheck contact ringtone. Incoming calls are no sound in mobile. But my sound volume in full. Why incoming calls are automatically used silent mode. What happens if you use speaker? Anyway, if there is no sound, you should check local service centre or return it. I am trying to change the ringtone of my moto E. Earlier, I was getting the pop up for “Complete action using”. Now I do not get it. I have ES3 File explorer installed. The system takes me to the files on the memory card by default without asking me to “Complete action using(media storage)”. Please help. Settings – apps – es file explorer, tap “clear defaults”. You are awesome. I didn’t even notice it !! I have set ringtone for some contacts. Now I want to remove the ring tone that I have set and maintain the same for all(bcoz the ringtone comes up not only for calls but even for messages from the user !!). I know that there is an option to set a ringtone to a user but not to remove/clear the ringtone. Would it help if I set the same current global ringtone once again ?!?! You still go to set ringtone, choose Default ringtone (you need select media storage, not es file explorer when set ringtones, to set to default ringtone). If the ringtone you want is not increasing volume when ringing, open it on your pc, use Audacity to edit the sound file. Choose Edit Metadata and check if there is an entry for ANDROID_LOOP with a value of true. If not, add it and export the sound, and save it back to the sd card. Use ES File Explorer to select it in the sound options. Just to add, when you export the file form Audacity, you should use ogg format. ANDROID_LOOP will force the ringtone to loop. I ve es file exp installed but still its not showing any option to choose bet es file and media storage…..what should do i do now..? Settings–App, tap the menu key (3 vertical dots), tap reset app preferences. Then try again. Where i can see the SD card option and the SD card files. Is there anyway to set individual notification/text tones for different contacts? Probably not. You can only set individual ringtones, not message notification tones in moto e.
I am not getting the media storage option . I have tried rebooting my phone..searched every possible place but the default ringtones are missing. I want them back. Please help . You can go to Settings — Apps, find the corresponding app, tap clear defaults. Would you please elaborate? Can you hear from the earpiece or the speaker? or the other party cannot hear you? I would like to disable ringtone for contact on Moto E , could you please guide me on this. Set the Ringtone to “None” in the ringtone list. can I set a separate ringtone for each contact? Yes, you can. In People app, open the contact, tap the menu key (3 vertical dots), tap set Ringtone to use a special ringtone for this person. Settings-Apps, tap menu key (3 vertical dots in top right),tap reset app preferences. When you are asked to choose an app to finish the operation, choose media storage,tap just once. Can not get a ringtone to “stick.” When I test an incoming call, I get a weird “outer space” type of sound, no matter which ringtone I’ve chosen. I think you ate referring to ascending ringtone. There are no settings in the phone to disable it. Some apps may adjust it. i by mistake clicked “clear data” on settings>apps>all>media storage instead of “clear defaults”…. now i dont find any of previous ringtones… what to do??? Clear data will NOT delete the actual ringtone files. It only remove them from the app database. You need reboot the phone to force a scan. Power off the phone. Then power on. Wait a few mins, check again. I am using moto from 7months, I had a problem I can’t set my favourite ringtone after I installed es file explorer. Go to settings–Apps–Es File explorer, tap clear defaults. Then try again. You need choose Media storage to see the pre-installed ringtones. I accidentally pushed the always button and now can’t get to the ez file thing…. Any ideas? Settings – apps- es file explorer, tap clear defaults. Try Settings–Apps, tap the menu button in top right (3 vertical dots), tap reset app preferences. If it is still not working, power off the phone then power on. I updated my software Frm KitKat to lollypop….but I am getting problem regarding ringtones….no matter what ringtone i select….at the end no ringtone while incoming calls…….and even the rotate screen option isn’t here……my device is moto e….any suggestion? I plugged my moto e to my pc, but instead of recognizing it as XT1021, it recognizes it as XT830C & I can’t use my files as ringtone. Can you help? XT 830C is Moto E for Straight Talk. So, it is correct. 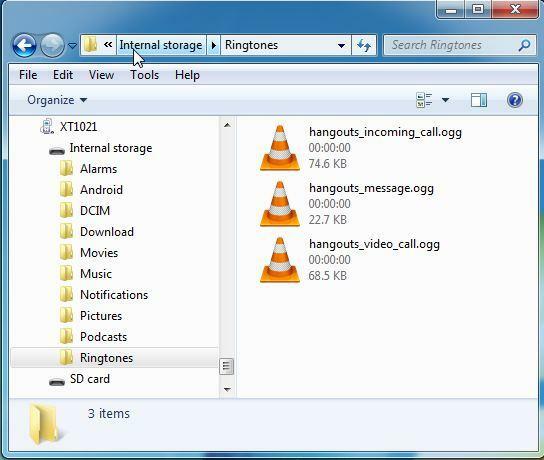 You can copy the audio file (m4a, mp3 or ogg format) into Ringtones folder as shown in this guide. In which step do you get errors? No, currently you cannot set different ringtones for each sim card. Android Lollipop 5.1 update will have native support for dual sim. Probably, you can set different ringtones for each sim. You have to wait for the update. When you change the ringtone, does it play normally? I put 2 “homemade” ringtones on my Moto E via usb/computer into ringtone folder, no problems. I set one to home phone and one to “general incoming calls”, don’t have “Es file explorer on phone, when I use “home phone” that ringtone rings fine, when I use another phone to activate the general incoming call ringtone, it goes to voice after 4 rings (its set time), but when I put it on any of the tones that came with the phone or switch to the “home phone tone” it rings through just fine. It acts like it can’t handle two “homemade” ringtones “online” at the same time. It will handle 1 ‘homegrown’ tone at a time and a ‘came with the phone one, but not two ‘homegrown’ ones (one for general and one for a contact). Thank you for any help you can provide, sorry for the long post. I tried and it seems I can use two customized ringtones without issues. Is the second audio file corrupted? When you choose the ringtones, do both audio files play correctly? if Galley app does not show some of your pictures and videos, you can reboot the phone. Why you cannot put the ringtone on the phone? Where is the audio file? How to reboot the phone? Press and hold the power button for 2-3 seconds, then tap power off on screen. Wait one min, press and hold the power button to power on the phone. If you tap the files in es file explorer, can you open them? What’s the extension of the files? What are the extensions of the files? jpg? You can try other gallery apps from play store. I installed other gallery app that’s also showing same files. It is not shows internal memory files. Did you try to put the files in downloads folder? Is any manual settings are miss placed? I want to set different ringtones for different contacts. I’ve looked at the questions & answers on here, but the instruction to click on the contact, then on the menu (three dots) doesn’t work. The only options I see when I click on the three dots are Share and Place on Home screen. Please help! Is that option gone in the 2nd gen? Once opening that contact, tap edit icon (pencil),which is left to 3 dots. Then tap the 3 dots in the new page. Now you can find the set ringtone. We will update this guide later. I’m sorry I don’t have the answer. I will reply if I know the answer or have the solution. while setting ringtone, i had selected “always” option by mistake. after that, if i’m going to select ringtone, it shows only default ringtones (inbuilt) only. how to reset this. please suggest. Settings – apps, tap the menu key (3 vertical dots in top right), tap reset app preferences. Then try again. Can I change my ringtone if I by mistake pressed always for phone ringtones and I want to select the ringtone through as file explorer ?? You can reset the app preferences in settings – apps. Tap the menu key (3 vertical dots in top right), tap reset app preferences. When? Does your phone slow down? If the phone does not slow down or restart itself, you probably can ignore it. Of course, it depends on hot it is. Not sure. Normally heating is not an issue nowadays unless it restarts or turns off automatically. How to put password permanently on WiFi? The wifi password is always remembered in Moto E. What problem did you get? That is the problem which you had said. The WiFi password is always remembering me how to avoid that problem? Tap and choose forget network. When someone called me, the sound of ringtone increased gradually, I cant hearing the ringtone from the start. You cannot change the ascending ringtones in Moto E.
i lost my saved ringtones n didn’t able to own it again. Even at the time of saving or loosing it, i didn’t install ES File Explorer. now for few calls i am not receiving atleast default ringtone. how to solve this problem. Did you use any apps to set Moto E ringtone? How can I set the ringtone for my group contacts???? You can set ringtone for individual contacts, not group. Did it restart when you use specific apps? The problem is usually caused by apps you installed. You can clear cache file to get a bit more space temporally. You can move media files to sd card and uninstall/disable apps that are not used to get more space. Hi, I set the phone ringtone using ES file manager and also set the default ring tone using the same. But instead of clicking just once option, by mistake i have clicked always use ES file manager option. I couldnt able to keep motorola inbuilt ringtones. How to change it. Please help. Clear app defaults for es file explorer at settings- apps – es file explorer. can i set a ring tone for my text (sms) messaging ? you can set notification tone in messages app. but you cannot set different tones for different contacts. In case instead of using just once i click on always while selecting the source of ringtone how do i restore it back. Clear defaults of the app. Of course, you can. After installing es file explorer ( or some other file explorer apps), you will get the option to use any audio files on the phone including SD card through es file explorer as ringtone. What errors did you get? Other members may help you if you share more info on the errors or messages. Very likely, you are using other apps to handle ringtones. Go to Settings–apps, tap menu key (3 vertical dots near top tight), tap reset app preferences. I have Moto E 2nd Generation 4G LTE. Followed all instructions. When I tap on the desired mp3 file for my ringtone, I get the message “Wrong file type, please select again”. The phone will play the mp3, but will not accept it as a ringtone. Any ideas? Did you try a m4a file? Are you using ES file explorer? 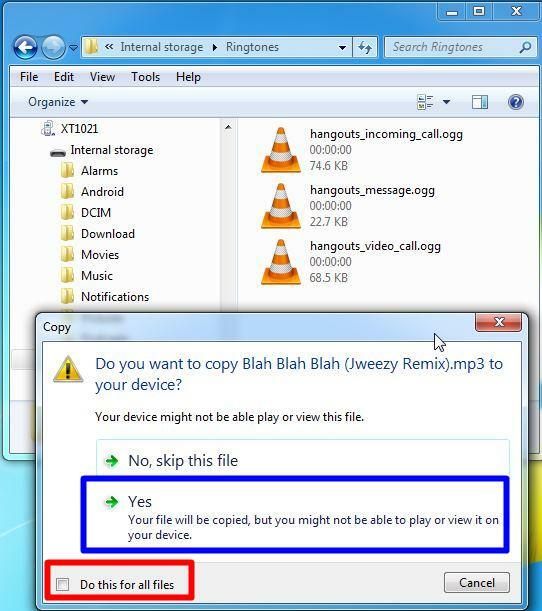 You can try to copy the file directly to ringtones folder. Then try again. If my moto e goes off, when I turn it back on, it has defaulted to wi-fi OFF and volumes are set to the lowest. I unfortunately miss a lot of calls because of this. Is there a special setting app or prayer that will let me change the default and power up values? Thanks. After powering on, Moto E should use the settings before it’s powered off. If WiFi is on before powering off, it should be on after powering on. Also, you should not power off the phone often. You can copy the audio file to ringtone folder directly. The media selection option will not be shown in Marshmallow. On my old Moto E, I had a custom ringtone I created myself that is a midi file. It worked fine, but now on my new E4 I try to install the same file and it won’t play it. Says “invalid file type”. Any idea how to fix this? Why would they remove support for midi files? The problem is related to the format supported by the internal media player. Please post article on How to set Ringtone in Moto E4 Plus.